Are you unsure of what to get the drinks lover in your life for Christmas? To save you from the festive online shopping fatigue, here is our list of last-minute gift ideas, no matter what the recipient's favourite tipple might be! "Inspired by the days of old, when the people of London would hold frost fairs on the frozen River Thames and sip on hot gin. This gift set contains everything you need to make a perfect Hot G&T." The Sipsmith website has an excellent selection of gift sets of different sizes and prices! 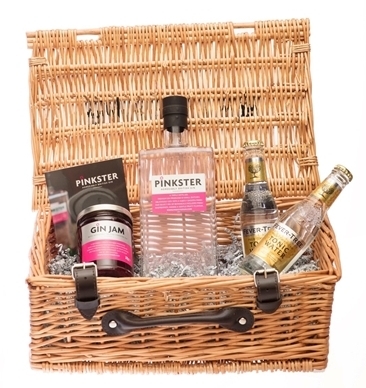 "Introducing the perfect Pinkster wicker hamper containing a bottle of gin, a jar of our scrummy Gin Jam and two Fever-Tree tonics. Surely the ideal present for the gin lover in your life?" We love the idea of a gin jam, and we're sure that the drink-lovers in your life will love it too! "Each pack contains 6 different coloured plastic baubles. Each bauble is filled with 5cl of Pickering’s Gin..." Nothing says Christmas quite like baubles and gin fused together! "The perfect Christmas gift for any cocktail lover! Add a little festive cheer to your Christmas list this year. The Christmas Cocktail Set comes ready to mix, with everything you need to make up to eight glasses of four delicious Christmas cocktail recipes - just add ice!" "A good aperitivo is said to help stimulate the appetite, making this gift set the perfect opener to any dinner party, sparking taste buds and kick-starting your evening in style. Featuring the tasty pairing of Crème de Pêche Liqueur with our finest Prosecco di Valdobbiadene, make every hour aperitivo hour." "Mix up Kir Imperial cocktails with this delightful gift set. Our Champagne is an excellent complement to Chambord’s rich flavours of red and black raspberries, Madagascar vanilla and XO cognac, so raise a glass and toast to whichever occasion takes your fancy."